This was originally a column in July 2005 in New Mountain Tribune for which I wrote a weekly piece entitled Cooking Peas & Qs. y. There are so many types of salad greens, and even more dressing options. That makes it easy to have your daily greens in a salad without becoming bored with the same flavors day after day. I love salad! It is crunchy, refreshing, and healthy. Each of these salad dressing recipes can be altered to your personal preferences. To make it a main course salad, simply toss sliced, cooked chicken in with the greens. 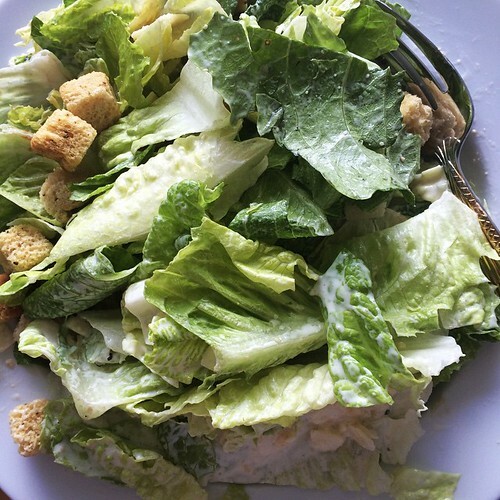 Enjoy homemade Caesar Salad with this simple recipe that doesn’t call for raw egg. The Crunchy Green Salad uses college-famous Ramen noodles to lend a tasty crunch. Tangy and sweet flavors make the Citrus Green Salad a colorful and lively addition to your meal. These delicious salads will make it easy to have your daily fruit and vegetable servings. 1. Squirt the lime juice over the avocado slices and set them aside in a cool place. 2. Combine lemon and grapefruit juices and oil with a whisk or hand mixer. Add paprika and salt to the dressing mixture then gently pour all but 3 tablespoons of it into a cruet or clean bottle. Cover and shake to mix. It should be stored in the refrigerator until time to dress the salad greens. 3. Add the honey to the reserved dressing. Mix them vigorously with a fork, whisk, or hand mixer before adding the blend to the rest of the dressing. Shake the cruet or bottle to mix everything together. 4. Place the clean and dry salad greens in a large bowl and add the orange segments. Shake the dressing up again and pour over the salad, tossing them together to coat. Serve chilled. 1. Place the garlic cloves in an air-tight container with the olive oil. Let the garlic marinate overnight. 2. Using a blender or similar gadget, chop and mix the oil, garlic cloves, Worchester sauce, and anchovy paste together. Pour in the vinegar and mix for 10 to 30 seconds. Add the lemon juice and mix again. Unless it is to be used immediately, refrigerate the dressing until time to serve. Right before adding to the greens, mix again. 3. Place the romaine greens in a large salad bowl with the artichoke hearts. Pour the freshly mixed dressing over top and toss gently to coat the greens and artichokes. Sprinkle the Parmesan cheese over the salad while tossing so it is evenly distributed. Serve chilled. 1. Combine vinegar, sugar, soy sauce, and all but 1 tablespoon of the oil in a cruet or clean bottle. Cover and shake to mix. It should be stored in the refrigerator until time to dress the salad greens. 2. Place the dry Ramen seasoning in a skillet with the sunflower seeds and sliced almonds. Add the remaining oil to coat the contents and stir over medium-low heat. Stir constantly so they do not burn, as this can happen easily. After about a minute or two of stirring, add the Ramen noodles. Crumble them into small pieces as you add them to the skillet. Once they are added, stir for a few seconds and then transfer it to an air-tight container. Store in the refrigerator until it is time to use. It can also be frozen if prepared properly in a freezer-safe container. 3. 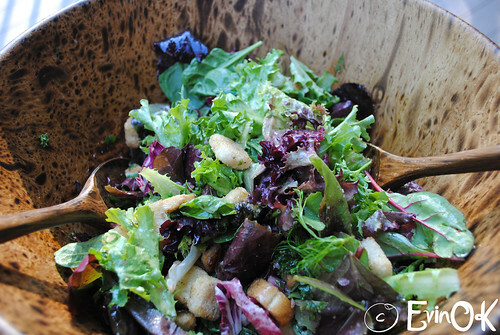 Place the clean and dry salad greens in a large bowl and add the optional ingredients as you prefer. Shake the dressing up again and pour over the salad, tossing them together to coat. Once the dressing has been added, sprinkle the noodle mixture over top and toss one more time. Serve chilled. This entry was posted in Lunch | Dinner and tagged Oriental green salad, Ramen noodle salad, salad dressing, salad dressing recipe. ← My Favorite Things in Washington, D.C.